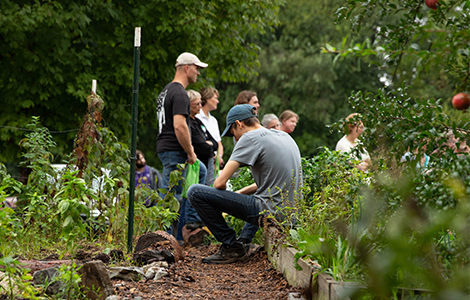 Service and community are key characteristics of Trevecca—and the University’s urban farm will be combining both in a project funded by a grant from the United States Department of Agriculture (USDA). The project targets neighborhoods located within the Nashville Promise Zone and is aimed at improving access to healthy food options in the area. The FSWG will utilize data outlined in previous reports and studies as well as gather new information through conversations, interviews and conducting surveys with current residents. The grant provides funds to hire 15 proctors from the community to survey other neighbors about the food security issues, as well as a consultant who has experience with conducting neighborhood inventories. The goal, according to the proposal, is to collect 500 surveys during the year-long grant. The project will also focus heavily on community partnerships, officials say. Once formed, the FSWG will consist of community organizations and leaders already involved in similar work—such as the Napier Community Center, Harvest Hands and Napier Elementary, among others—to better engage area residents and determine the best actions to meet the community’s needs. Adkins says this process will allow the community to discover and utilize solutions that are already in place while also empowering neighbors to tackle newly identified problems together. USDA community planning grants provide a one-time infusion of federal dollars for community-based food projects but are often precursors to larger and longer-term community food project grants. This year-long planning grant provides the fund to create a food security plan, but not to implement it. The University hopes future grants will allow them to put the plan into action.